I wasn’t aware of my thinking boundaries. I was just over on FB when a connection posed a question about God and Lucifer. I’m qualified to respond, given my background and degree and I challenged both the question and the questioner. Back and forth the comments went, as they do on FB. I was reasoned and considered in my responses. But the other person wasn’t happy and, eventually, I said, “I’m done”. Nothing more could be gained by pursuing the discussion. As I went to bed and mulled over the interchange I started to think, “What if I’d…?” That started my thinking down a well-worn path of assuming responsibility for the course of the discussion. I didn’t quite blame myself for the way the discussion panned out, but I was heading in that direction when I stopped myself. I gave myself a mental shake. I’d responded clearly, considerately and authentically. The other person’s dislike of my responses was not my fault or responsibility. Their emotional reaction was their responsibility. I wasn’t rude or unkind. I was true to myself and how I see the world. How the other person responded was their responsibility. Why do we do that to ourselves? Is taking responsibility for other people’s responses or reactions to us and our way of doing life a healthy thing to do? Why do we think that if we’d changed the way we’ve done something, or said something different, then they wouldn’t have been upset with us? The reality is that we can only control our own responses and reactions. We can only control our own thought processes and emotions. We cannot control, and therefore we are not responsible for, the responses of other people to ourselves. Understanding this is part of the subtle art of self-leadership. As we understand more fully that we are only responsible for our own thought processes and responses then we can stand more firmly in the truth of who we are as unique human beings. This authenticity and integrity allow us then to set clearer and firmer boundaries, first and foremost in our own thinking and, consequently, in our behaviour and attitudes to others. It is important that we set boundaries in our thinking before we can set boundaries around behaviour. 1. so that we don’t default to unhealthy patterns of thinking 2. to limit the influence other people’s attitudes and opinions have over how we think 3. to set us on more authentic thought paths that are in line with our values. Let’s do away, bit by bit, with the notion that we are at fault and that we must fix things.Sometimes the best, most healthy, thing we can do is walk away – for ourselves, for others, and for the situation. To understand more about having courageous conversations with yourself, fill in the form below. We will talk about how you can set healthy boundaries in your own thinking. To trust your unique authenticity can be challenging at times. You know how it goes – post an article, make some comments and you put yourself out there. You’ve had lots of great feedback. You know you’re resonating with others. Then some person you don’t actually know, a random online connection, criticises you for what you said, or how you said it. And immediately you feel the need to go into defense mode, to justify yourself, to make this random person you don’t actually know see things from your perspective. Don’t you hate that just one person’s opinion has the capacity to derail you and flatten your mood. Sound familiar? I’m sure it does. It happens to anyone who is running a business or developing influence online. I wrote an article a week or so ago about handling personal attacks and suggested that responding rather than reacting is the way forward. It got amazing coverage and I engaged with lots of new people. Some joined my email list on self-leadership. And then one person unsubscribed after the first email and, when I asked if this was intentional, they responded that they didn’t like that I’d included links to my coaching and events rather than just sharing knowledge. I responded that I didn’t feel the two had to be mutually exclusive, to which they removed our connection. I find it easier to stand firm and respond with things I believe in than I do when judgements are made of me around how I operate in the online space. But what it comes back to is confidence in what I’m doing and how I’m doing it. It boils down to being confident in who I am, because it is out of who I am that I do and say things. The fact that I’m writing about this means that I’m still growing in confidence around my authenticity. But with each new experience, as I operate authentically out of who I am, my confidence grows, and so the attacks and criticisms have less and less impact. I’m learning that even with the best of intentions, others will not always like what I do. Others will have opinions around the way I operate and will let me know. But it is up to me to choose how I respond to that criticism. Responding is the better way as it allows me to think about what I want to communicate. And as I respond, I learn to trust my unique authenticity. But just because I choose to respond rather than react doesn’t mean that I will have the outcome I desire. That person who criticised me may still not like what I do. They may react. I have no control over that, and their reaction can still be confronting or challenging. Then I must come back again to my own authenticity. Finally, I must return to my centre, to the person I know I am and allow the other person space to be who they are, acknowledging that we may never see things the same way – and letting it go. Authenticity and confidence go hand in hand. And confidence in our unique authenticity grows as we trust who we are and how we respond to situations and events, online and in the real world. To talk more about growing in confidence as you trust your unique authenticity, leave your details below. Let’s see if we fit. Choosing self-leadership is a bit like rearranging the furniture. How often do you rearrange the furniture in your home or office? When we do, the space often seems lighter or more open because we see the space differently. As a teacher, I rearranged the classroom every term. I needed to see the children I taught in different groups, to see them in different ways. Rearranging the furniture in our lives works the same way. We all have life events, life stories, that impact the decisions we make and the way we look at our careers. Some life events influence more than others and so play a greater role in our lives. One of my most significant life stories was my 28-year marriage, a marriage I ended because I could no longer stay. It took me a few years to realise that my ex-husband’s passive-aggressive way of relating was really a form of emotional abuse. However, I felt I had failed because I’d left the marriage. I’d tried so hard. I’d invested huge amounts of mental and emotional energy on “getting things right” because, If I could do that, then the marriage would work. Right? The success of any relationship – business, career or personal – depends on the input of both people. It wouldn’t have mattered how hard I worked, or how long I worked, the marriage was not going to succeed because I was the only one working on it. Cognitively, know the truth of this, but from time to time I still feel like I failed at the one thing that was most important to me. I remember so clearly the day a psychologist congratulated me on having had a 28-year marriage. Where I could only see failure, she saw huge success in maintaining a relationship for that length of time. She helped me rearrange the emotional and mental furniture around my marriage. When we rearrange the furniture in our lives, when we look at our life events and determine to change the stories that we tell ourselves about our worthiness, our ability to succeed, our desirability as a partner, or any other thing that is important to us, we are not immune from wanting to change the furniture back to the way it was before. Just like I occasionally feel that I will never succeed at anything because my marriage didn’t succeed the way I wanted it to, we can fall back into the default ways of thinking and looking at life…IF WE CHOOSE TO! Realising that I get to choose how I look at my life stories, understanding that every day I get the opportunity to rearrange the furniture however I choose, is hugely freeing. As a leader, I am first and foremost responsible for myself and to myself. I can choose to self-sabotage by allowing the default ways of thinking to influence how I see my life in 2019. I can also choose to shift that furniture around and look at my life stories in new ways. I can choose to see the success of holding together a marriage for 28 years. And I can choose to see the safe warm family I created for my sons which two have gone on to emulate and exceed in their own families. I can choose to have pride in what I did in saving myself from an abusive relationship. Or I can choose to see my life and business ventures as doomed to fail because my marriage did not work out as I hoped it would. The art of self-leadership is being able to connect the dots between life events and what is happening today, right now. It is being able to see the patterns of behaving and thinking that may be unhelpful and then choosing a different path. Self-leadership comes down to choosing, often daily, the stories out of which we live. If you are a woman who leads, who wants to explore ways you can lead yourself, and others you’re your peak potential, I’d be honoured to facilitate that. Email me at bron@backstory.com.au. Self-leadership is a choice we all can make. How do leaders handle difficult emotions? Have you ever felt rage, or any other difficult emotion, so deeply and intensely that it threatened your ability to operate normally? If this happened in the workplace, how did you manage that? The rage I felt was cold and deep. It sat on my chest with such weight that I felt that if I didn’t get out of the water I’d forget how to swim. My rage, an emotion I have rarely felt (I’ve been angry, but this was very different) was one of many emotions I experienced in the last month of my mum’s life. It manifested itself after Mum agreed to go in aged care. I was elated that, after a year of negotiating this next step with my very switched on and independent mother, she had finally agreed that she could no longer look after herself and would make the move to aged care. In that year, Mum had been hospitalised four times, two because of significant breaks from falling over. In that year, my siblings, their partners and myself had tag-teamed being with Mum in her house, because we knew that she was no longer safe to be on her own. My rage came from feeling that we’d all wasted a year delaying the inevitable. That in that year, Mum would have found a new lease on life, perhaps not fallen as much and we would have been saved months of worry that lay beneath every decision we made. Now, I know there may be people who will decry my feeling such a thing in the face of Mum’s impending passing. But emotions have no moral value. They are neither good nor bad. They just are. But what we do with them is key. How can we handle difficult emotions? Usually we have three choices with emotions, be they easy to handle or unpleasant. We can resist them and push them down – only to have them rear up when we least expect them to. We can give vent to them in an unrestrained and unfiltered way with accompanying consequences (even unrestrained joy can be difficult for those around us to handle). Or we can acknowledge what we feel and then decide how we want to respond. With my rage, I got out of the water because I knew I had to focus on what I was feeling. I went and sat in my car and explored not only what I was feeling but dug into the why, and then returned to Mum’s place and chose not to act out of that emotion. I understood why she resisted the move for so long and it was important for me to hold both my own emotions and my understanding of my mother in balance – and then choose how to deal with the situation. So how do we apply this as women who lead? What can a leader do with difficult emotions in the workplace? In any situation where we lead others we will be triggered by their actions, attitudes and emotions. That is unavoidable. And, unfortunately, women and their opinions are unfairly dismissed as being too emotional and thus less valid. But the strength of women is that ability to tap into their emotions. Emotions are indicators of things happening at an unconscious level that, when identified, can bring deeper awareness to a situation. Allow the emotion its space to just be – give time to recognising exactly what you are feeling. Try to identify what the trigger was and why this event has elicited this particular emotion. However, don’t judge yourself or the emotion. Decide how to respond both to the emotion and the situation that triggered it. What you do with the emotion is key to your growth and effectiveness as a leader. Emotions can be wonderful tools for self-awareness and self-leadership. Acknowledge the presence of emotions. Allow them space, let them pass of their own accord and in their own time. Use emotions to lead others, and yourself, well. How are you handling your difficult emotions? You can develop skills for handling emotions in the workplace. To find out how, schedule an initial session by filling in the form below. As a coach, I connect with other survivors through our shared experience of abuse. Our situations are usually quite different, but the impacts and consequences are so similar – the same stories told in different words. We connect through shared experiences of pain and heartache, of silence and hiddenness, of shame and guilt. And we also connect through shared determination and persistence, shared courage and compassion.. We also connect through a shared desire to rebuild lives afresh. Most of us do not play ‘my trauma is worse than your trauma’ drama games. Triggers still occur from relatively small events. However, those triggering times are less intense and less frequent as time goes on. And most of us seek to use those difficult experiences as sources of wisdom to share with others. Australian anti-domestic violence campaigner, Rosie Batty’s, recently decided to close her son Luke’s foundation, disperse its funds to other charities. She wants to focus on her on health and well-being, This decision is an example of the ongoing cost of abuse. Even when the experience of abuse is used for incredibly positive ends the need for self-care is so necessary. I wish Rosie well in her time of looking after herself. Others will take up the baton because, sadly, domestic violence and domestic abuse isn’t going away. In ten days in Australia in early October, eight women died violently at the hands of someone they knew or had been in an intimate relationship with. That’s only the tip of the iceberg. So many people suffer in silence behind closed doors, as their partner abuses them financially, emotionally, mentally, sexually or spiritually. Abuse is real – whether there are physical scars to show for it or not. Healing and wholeness post-abuse is also real too. Abuse shapes you, but it doesn’t define you. In abuse you bury your dreams in order to survive, and you can recover them. Despite its awfulness, abuse births superpowers that can uncovered and unleashed. Have you been out of an abuse environment for more than two years? Are you sensing that the time is right to make some real steps forward in rebuilding your life? 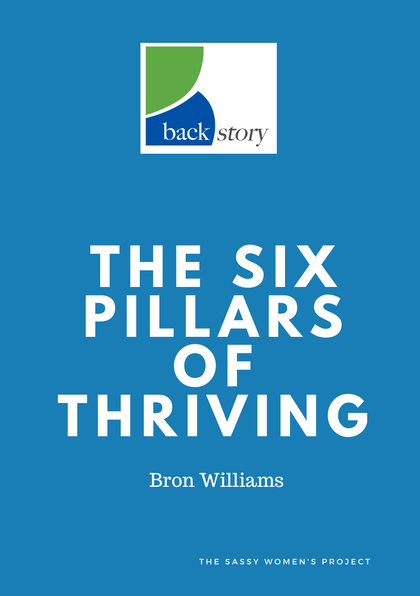 Then accept a complimentary copy of The Six Pillars of Thriving. Just leave your details below and it’s yours. Be powered by your past!